Discussion in 'Elections & Campaigns' started by APACHERAT, Jan 21, 2019. The 54-year-old will highlight her career as a prosecutor with the campaign slogan “For the People.” She joins a Democratic field that includes two of her Senate colleagues, Massachusetts Sen. Elizabeth Warren and Kirsten Gillibrand of New York, along with former U.S. Housing and Urban Development Secretary Julián Castro and former Maryland Rep. John Delaney. The field could grow in the coming weeks with the potential entries of Sens. Bernie Sanders of Vermont and Cory Booker of New Jersey, former Texas Rep. Beto O’Rourke, former Vice President Joe Biden and others. Kamala Harris has a lot of blood in her hands in California. Dead cops, illegal aliens killing American citizens all aided by Kamala Harris. Well it's all up to the DNC if Harris will win the Democrat nomination or not. A Problem for Kamala Harris: Can a Prosecutor Become President in the Age of Black Lives Matter? KAMALA HARRIS HAS a prosecutor problem. She’s running for president as a progressive, but as attorney general of California, she criminalized truancy — making it a crime for kids to be late for school, and dragging into the criminal justice system even more disproportionately low income, predominantly black and latino families. She’s overlooked the misconduct of her prosecutors and fought to uphold their wrongfully secured convictions. She defended California’s choice to deny sexual reassignment surgery to a trans inmate, and in 2014, appealed a federal judge’s holding that the death penalty was unconstitutional. The list goes on and on. But in some ways the details don’t matter. The problem isn’t that Harris was an especially bad prosecutor or a member . She made positive contributions as well — encouraging education and reentry programs for ex-offenders, for instance. The problem, more precisely, is that she was ever a prosecutor at all. To become a prosecutor is to make a choice to align oneself with a powerful and fundamentally biased system. As Paul Butler, former prosecutor and author of “Chokehold: Policing Black Men,” told The Guardian, “as a lawyer who went to law school with a goal of helping black people and using my legal skills to make things better, the realization that the law itself was a mechanism to keep African American people down was frightening.” He added, “Lawyers are competitive and ambitious, and the way that manifests itself in a prosecutor’s office is you want to get tough sentences. I got caught up in that world. You feel like you’re doing the Lord’s work — you tell yourselves that you’re helping the community.” But, he vividly recalls, the expectation is far from reality. To become a prosecutor is to make a choice to align oneself with a powerful and fundamentally biased system. However will Kamala overcome the simple fact that, while AG of CA, she represented the elite of CA and worked so actively against the underclass in CA? Can you see the debate line? Ms Harris, when you were AG of CA and you implemented the law the made truancy a crime and started incarcerating minority students across your state, did this prepare you for making this a national standard that you might impose an executive order to create nationally? Jestsayin, MMC and APACHERAT like this. Harris also wrote the title and summary for PROP 47 so when the voters went to the polls they didn't know exactly what they were voting for and today California has more criminals walking on our streets since pre three strike laws. That's where Kamila Harris being a cop killer and having blood on her hands. Many of the cop killers over the past few years in California weren't in prison because of Prop 47. Blaster3 and drluggit like this. MMC and APACHERAT like this. Internet research worthy of a certain agency. I cannot imagine a more inexperienced, unqualified candidate. Her California State offices were nothing of accomplishment nor experience. More about keeping a seat warm. Her power starts at the Bay Area Political Dynastic system. And that system has its' GOP side and its' Democratic Party side. That is why so many of our State office holders are from the less populated North. Remember: If You Do Not Support Harris. YOU are a RACIST. MMC, Blaster3 and drluggit like this. She sounds like a screech owl when she talks. Worse than H if you can believe that. Even to use the term "mulatto mafia" reflects the racism of the Republican poster. It is almost hilarious that Republicans deny being bigots out of some desperate deflection; the least introspective hysterics among us. You notice that there is no Republican senator from California and hasn't been for decades. Hell, there are only 7 Republican congress people out of 53 seats from California. Easily that will stay that way in our lifetimes except that there's a likely chance that there be no California Republicans by the next election. We don't vote for them across many Western states. Little people who whine are very unappealing, quite frankly. Pants, AZ. and bigfella like this. Whenever a tRUMPette talks about others, skin color is very very important. And if the color isn't white, watch out. You will be ridiculed because of that. Like this guy who she married. MMC and drluggit like this.
. Little people who whine are very unappealing, quite frankly. um..... have you listened to democrats? Whining is all they do. Non stop. Endless whining. MMC, vman12, Blaster3 and 1 other person like this. Care to support your allegation with a citation? Otherwise you are intentionally lying. Which is it? I've never even heard of 'Key Wiki' and see they are a communist organization with likely dubious credibility. 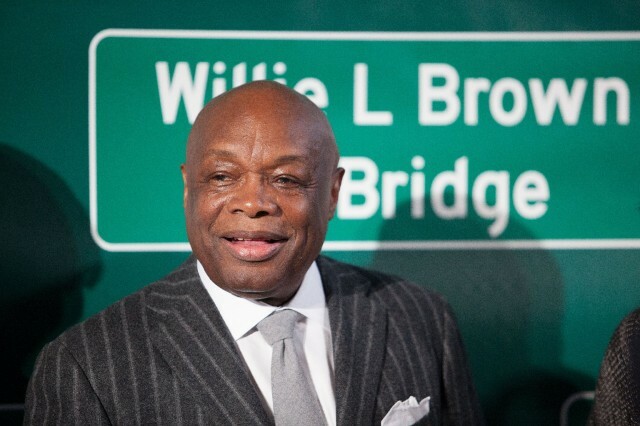 I wonder if Willie Brown even participated in the event cited. KeyWiki is a wiki site which purports to be "a bipartisan knowledge base focusing primarily on corruption and the covert side of politics in the United States and globally", with a "particular interest" taken in anyone or anything considered to the ideological left of the founder, Trevor Loudon. Launching in April 2010, it opened with 35,000 profiles on people it links with the Democratic Socialists of America, the Center for American Progress, and other progressive organizations. The wiki is openly anti-socialist, and anyone who has even signed a petition from a left-wing group is also indexed on KeyWiki. The site strictly limits who can edit articles. KeyWiki is an online encyclopedia run by Trevor Loudon which focuses "primarily on corruption and the covert side of politics in the United States and globally". Much of the content tracks Communist infiltration into various sectors of public and private life. Loudon has spent much of his life fighting against Communist forces in New Zealand, and was featured in the film "Agenda: Grinding America Down", along with M. Stanton Evans, Edwin Meese III, and Phyllis Schlafly. KeyWiki is an online database, similar to Wikipedia focusing on documenting political adversaries to right-wing causes, policies and organizations. She's getting ****ing destroyed on Twitter by leftists. Not as bad as Pocahontas, but pretty bad. APACHERAT and MMC like this. and? that link shows todays profile, a clinton protege and democrat party supporter, whom is also and avid member of the communist party, iow, it proves an established link between democrats and the communist party, and thats your citation that the site is communist??? It doesn't prove anything especially considering that when you google the topic only one citation comes up and it is the Communist party. Even Wikipedia can be incorrect sometimes. When you look at the Senate Democrats who have announced their presidential campaigns so far, you notice that each one has a theme. For example, Sen. Elizabeth Warren, D-Mass., has made her career about reform of the financial industry. Sen. Kirsten Gillibrand, D-N.Y., has made hers about preventing workplace sexual harassment. Sen. Sherrod Brown, D-Ohio, who has all but announced his candidacy with his tour of Iowa, has made his campaign about what Democrats still have to offer the working class. But what about Sen. Kamala Harris, D-Calif., who announced her candidacy on Monday? Look only at her two years in the Senate and two relevant data points pop up. First, there’s her recent attempt, along with Sen. Mazie Hirono, D-Hawaii, to apply an anti-Catholic religious test to a judicial nominee because he belonged to the Knights of Columbus. This was too much even for her fellow Democrats to bear — not a single one objected to a resolution that implicitly rebuked Harris and Hirono for their behavior. These two incidents clearly indicate the kind of progressivism that Harris espouses. It is the same intolerant, authoritarian, by-any-means ideology that stretches back into her earlier career as a prosecutor and as attorney general of California. The Demos even wanted her rebuked. She will have a tough time going against Bloomberg and Tulsi Gabbard. I'm a Californian who votes Democratic [though a registered Green party member]. Kamala has a fair amount of support though not like Diane Feinstein who is a moderate Democrat and will be around 90 yrs old when current senate term is up. Kamala Harris is attractive/ personable/ articulate but not the kind of dynamic personality of other possible and/ or declared Democratic candidates. 3 people who stood out in the last election were Beto O'Rourke/ Stacey Abrams/ Andrew Gillum; unknown to most Americans but quite compelling. Democrats are rich in potential candidates. If Kasich challenges Trump, some Democrats would actually vote Republican, ironically. But most of us stay far away from Trumped Republicans. Ever hear of the Democratic National Committee ? They are a corrupt banana republic political organization with financial ties to Communist China who have thousands of Marxist, socialist, self proclaimed Native Americans with 1/1000th Indian blood as members.